Looking for a romantic hideaway with a private pool, or a great value all-inclusive resort? Fancy a game of golf or want to bring the kids? If you are wondering where to stay in Mauritius, I’ve got you covered! When you think about Mauritius, luxury hotels on white powder beaches spring to mind. While that sounds pretty good, it is only scratching the surface. From snorkelling to whale watching, waterfalls to water-sports, fine dining to creole cooking, Mauritius is an island of contrasts. One minute you can be on one of the best beaches in the world, the next, navigating rolling hills and seeing remarkable wildlife. 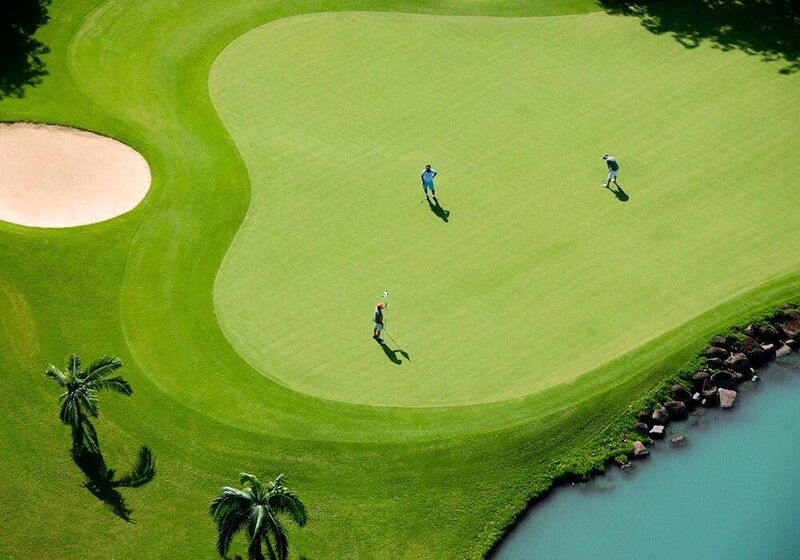 Mauritius has also been recognised as the best golf destination in Africa and the Indian Ocean region, by the International Association of Golf Tour Operators. 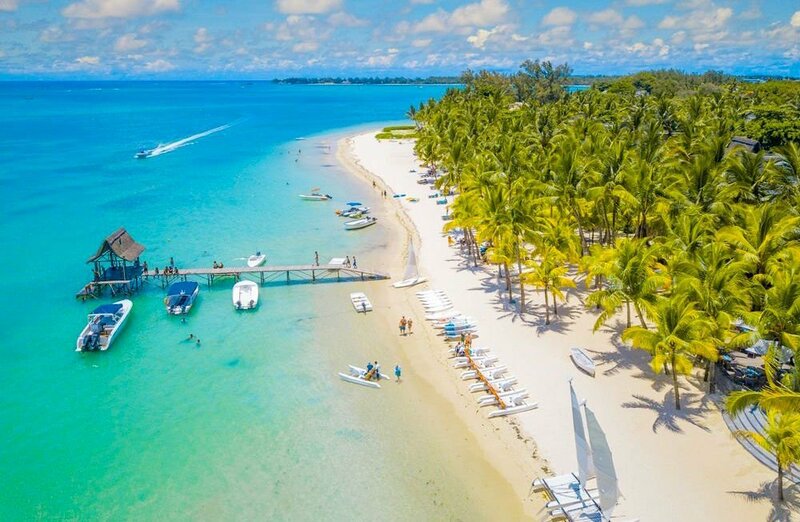 All that being said, it is the luxury hotels and white sandy beaches that attract millions of holidaymakers each year – and Mauritius has plenty of them too! 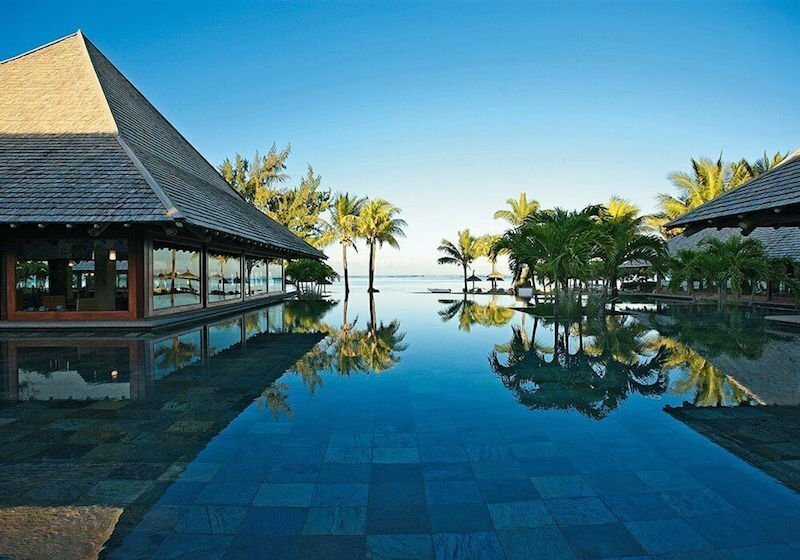 But where to stay in Mauritius? There are so many hotel options to choose from it can be daunting trying to decide which one is right for you. I have teamed up with Tropical Sky who offer a wide variety of holidays to Mauritius. From all-inclusive hotels to family holidays, golf breaks to weddings, their expert staff will recommend the right hotel to suit your requirements. I have some ideas on where to stay in Mauritius below, but Tropical Sky can tailor make any holiday to suit you. If you wish to stay longer, or combine a holiday to Mauritius with Dubai or South Africa, just talk to their travel experts and they will organise that for you. Veranda Pointe aux Biches is a hotel that epitomises laid-back luxury – you are actually encouraged to go barefoot during your stay ❤️. Highly rated on tripadvisor, with all meals and drinks included in the price, this is excellent value for such a great hotel. Feel relaxed in the wellness lounge, enjoy some spa treatments, or try the host of watersports available. If you fancy a change of scene, you can pop into the nearby village of Grand Baie, which has a wide selection of restaurants, shops and bars. The hotel offers a free shuttle service three times per week. 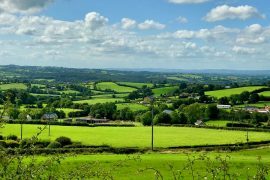 If you want to get out and about and explore this beautiful island, the hotel will even give you a picnic hamper to bring with you, this is all part of the all-inclusive arrangement. Set in 60 acres of tropical gardens on a white powder beach, it is as their slogan says, ‘beyond paradise’. 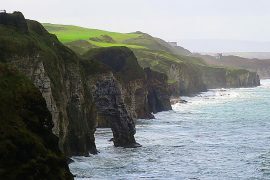 Many choose to get married here, you can for as little as €495! 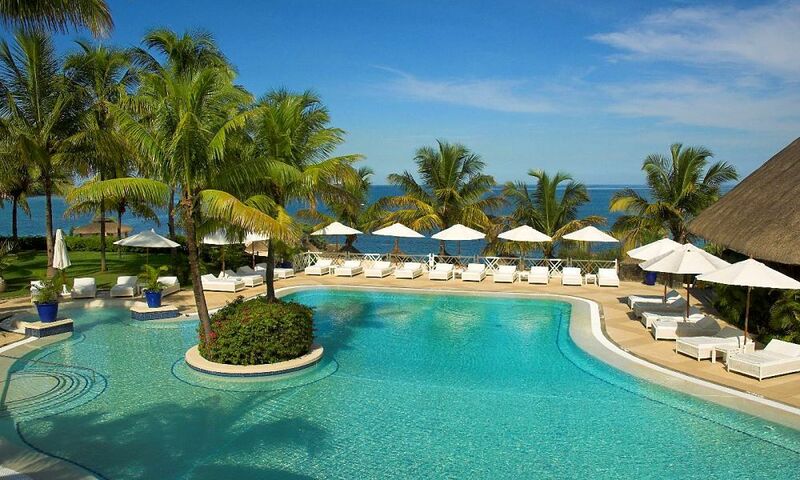 This five-star, all-inclusive resort offers superb facilities including horse riding, deep-sea fishing, golf and a spa. If you just want to relax, the hardest decision will be the pool or the beach! If you choose the beach, there are numerous water-sports and a dive centre to keep you entertained. If you choose the pool, you may find it hard to tear yourself away from the swim-up bar . The dining options are excellent, as are the selection of drinks available in the all-inclusive arrangement. 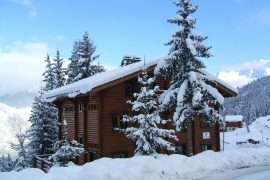 You can enjoy quality French wines and imported spirits, or drink from your own minibar without any additional charges. If you fancy a change of scene go down to the beach at night time for the bonfire night or some romantic star gazing. Alternatively pop into Mauritius’ vibrant capital, Port Louis, or the lively tourist centre of Grand-Baie, both located close to the hotel. The combination of complimentary kids and teens clubs and the wide selection of facilities available, make this an ideal choice for a family holiday in Mauritius. Located on the south coast of the island, it is beautifully situated on a lagoon with crystal clear water. This is a great place to snorkel or learn to scuba dive. 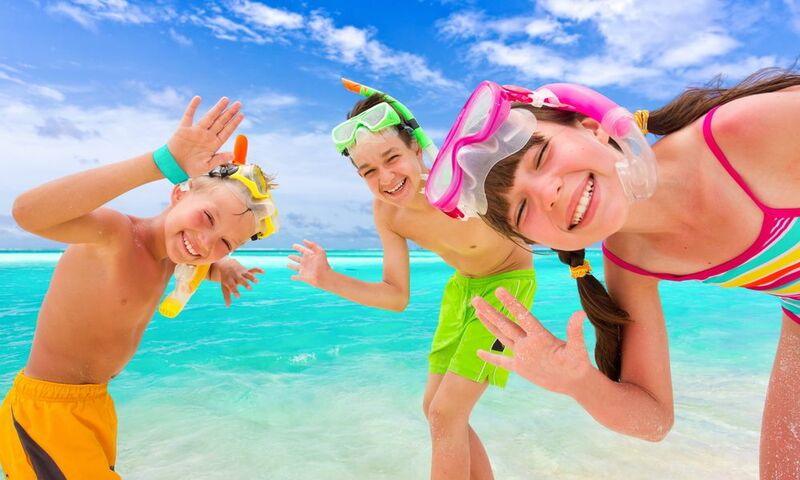 Snorkeling, water skiing, glass bottom boat trips, windsurfing, kayaks, pedal boats, small catamaran, mini sailing are included in the cost of your stay, so it is a great opportunity to introduce your kids to watersports. There are plenty of activities available on land too, including mountain biking, tennis and beach volleyball. The kids clubs are open from 9am – 10pm and they arrange both indoor and outdoor activities, including beach sports, language lessons and adventure trips for teens. As well as three main restaurants, I love that you can get gourmet street food from their very own Chef’s Truck! 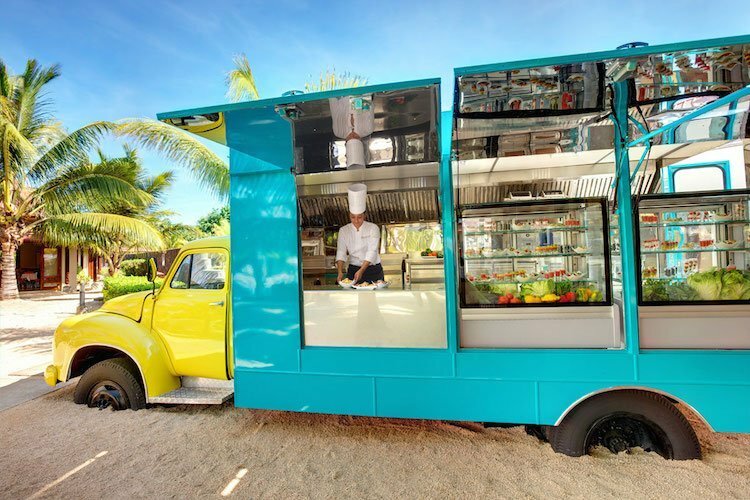 They boast ‘the finest island-style burgers you’ll taste in southern Mauritius’, as well as paninis and authentic Mauritian wraps. I’m sure kids would love this! 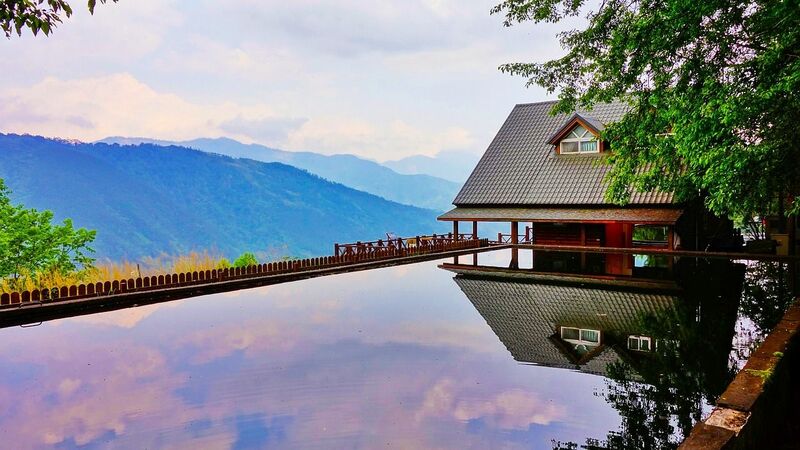 You own villa with butler service and a private pool in a luxurious five star resort – it doesn’t get much better than that. If you are looking for peace and privacy in stunning surroundings, then look no further than the 5* Maradiva Villas. With Hermès decor and amenities, you will have to try the free standing bath and the outdoor shower in your private villa! 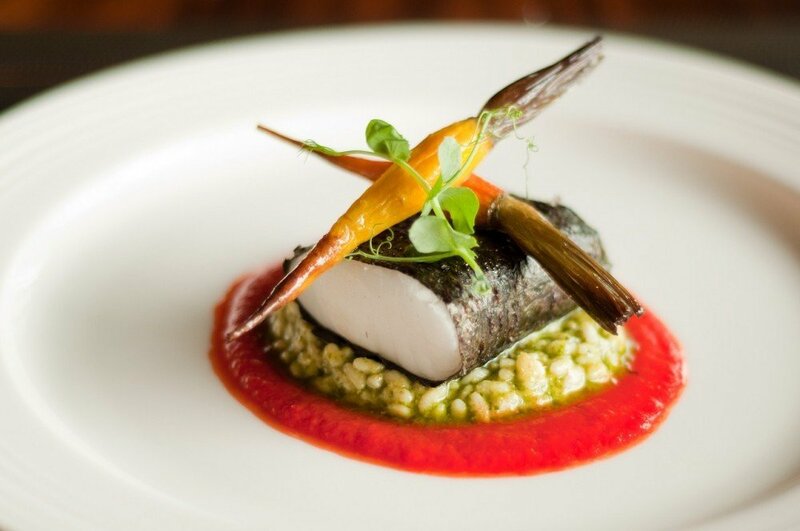 Treat yourself to some of their award-winning spa treatments, snorkel in the Indian Ocean and enjoy some fine dining in one of their many restaurants. 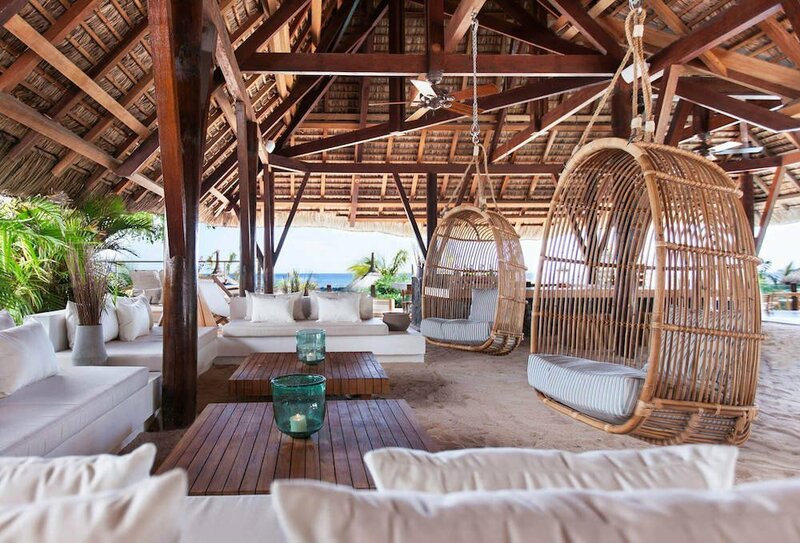 The Maradiva Villas are considered one of the world’s most romantic tropical beach stays. If you are travelling on honeymoon or for a wedding anniversary, you are in luck. The Maradiva Villas offer up to 40% discount and a host of extra treats, so make sure you ask the staff in Tropical Sky for more details. 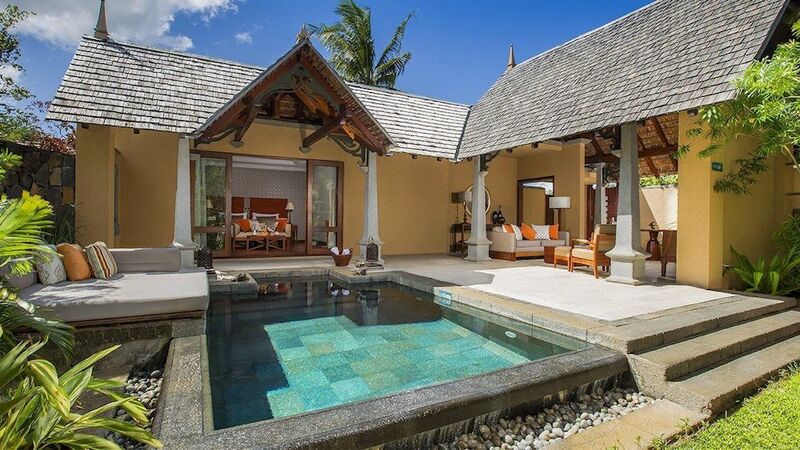 Not only is this one of the best hotels in Mauritius for golf enthusiasts, but the Heritage Awali Golf & Spa Resort also boasts ‘the best all-inclusive resort in Mauritius’. Recently renovated, this five-star resort offers superb facilities, a wide selection of dining options and a freshly stocked mini-bar in your room each day. Golfers will enjoy the reduced green fees, which can be pre-booked, at the award winning Championship Heritage Golf Course. Beach lovers will enjoy sailing, windsurfing, pedal boats, snorkeling and glass bottom boat trips free of charge, and there is also a back massage included (one per person per stay ) in the Seven Colours luxury spa. Surrounded by 2,500 hectares of greenery, in the unspoilt south-west of Mauritius, this is the perfect for those looking a luxurious yet authentic experience. Enjoy eco treks, mountain biking and guided tours of the Frederica Nature Reserve, all included in your stay. If you are travelling with kids, there are numerous clubs to keep them entertained too, including dedicated teens club. I hope this post has helped you with where to stay in Mauritius. 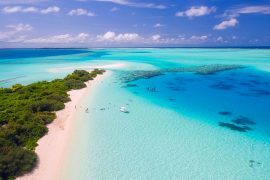 If you wish to add on extra nights or combine Mauritius with another destination, contact Tropical Sky and they will be able to tailor make a trip to suit you. This post was sponsored by Tropical Sky, but all views, as always, are my own. Like this post? 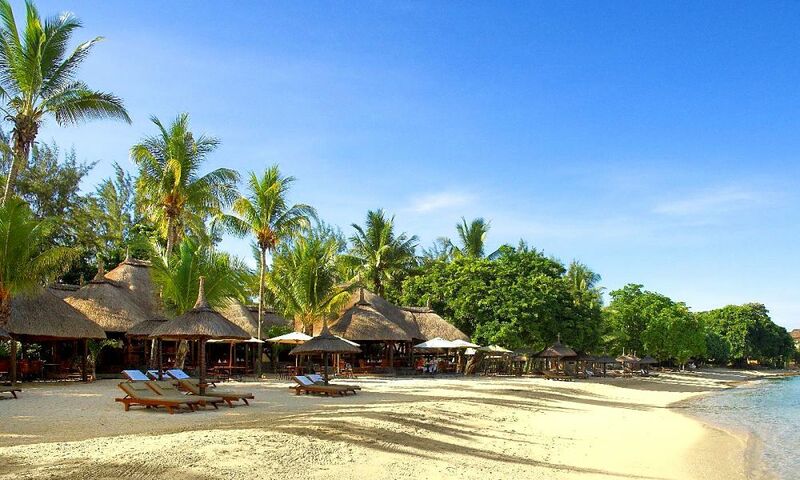 Check out luxurious but affordable resorts in the Indian Ocean here. 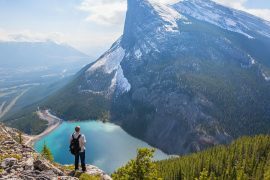 5 Ways to Visit Canada – Holidays from €1749 Incl Flights, Accommodation & Tours! Next articleSummer City Break to Madrid – 3 Nights Including Flights & Hotel in July, €184!